The pockety highball face of Mossy Rock has been climbed since at least the early 1980s as a short toprope or highball boulder problem but not until the recent popularity of bouldering has its other faces gotten much attention. 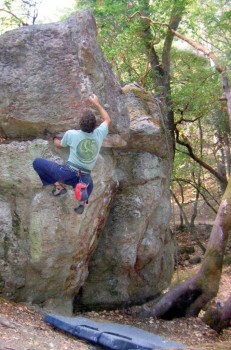 Sitting on the side of the popular Mossy Rock Trail, a popular hiking/mountain biking trail in the hills outside of Angwin, is Napa County’s exclusive bouldering area. This is also a great place to get out and enjoy a beautiful forest on foot, on bike, and on rock. The pocketed volcanic stone is similar to that of the nearby sport crags Bubble Rock and The Far Side on Mt. Saint Helena. There are about 10 to 15 good boulder problems from 5.6–V5 at Mossy and about 5 to 10 more partially developed boulders from 5.6-V5 further up the trails at the Angwish Boulders. Footloose V2r, No Brain No Pain V3, No Pain No Gain V4, Dirty Dancin V0, Mossy Rock Traverse V4, Angwish Traverse V5. Which SuperTopo guidebooks cover Mossy Rock? Professor Floyd on Mossy Rock.